In this series of blog posts research volunteer Alison Jones uncovers the life of William Stott of Oldham, from his early childhood through to his artistic career follow Alison’s journey. The 1870s and 1880s was a period of great expansion in Oldham’s cotton industry. Cotton waste dealers were often in key positions to take advantage of the booming conditions, particularly those who had done well out of the Cotton Famine. In 1861 Abraham Stott was a cotton waste dealer and dyer at Bell St Mumps and Rhodes Bank. In the late 1860s there are a number of references to Abraham Stott, cotton manufacturer or spinner and a Middleton Road address. He may have been renting space before or whilst building his mill. Stott’s new venture, Osborne Mill, Waddington St., was a medium sized mill, employing 100 hands. 1871 William Stott aged 13 was living with his family at ’ Westcott’ on Middleton Road in Chadderton, within easy walking distance of the new mill, building of which was certainly going on by 1873. By 1875 the family had moved again to 81 Windsor Road and Abraham Stott, with the help of his sons, continued running the family firm of spinners and dyers and they had a place in number 10 Arch Royal Exchange Manchester. By now the Stott family, Abraham, his sons and their families were part of the comfortable if not wealthy middle classes and were probably quite keen to present a respectable front to the world. Elizabeth Stott died at 81 Windsor Road in 1887 of apoplexy and following his wife’s death Abraham moved to Wilmslow to live with his son Samuel Taylor Stott, and his 5 children including Edwin, who was a medical student, and Harold, who was spinning cotton. He continued to be involved with the business. 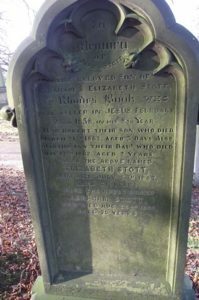 Abraham Stott died on the 22nd August 21898 in Wilmslow. Abraham and Elizabeth are buried in the family plot at Chadderton Cemetery. Abraham Stott and Sons (Holdings Limited) Cotton Spinners, Waddington Street, Busk was liquidated on 19.3.1957, and Abraham Stott and Sons Ltd closed in 1967.